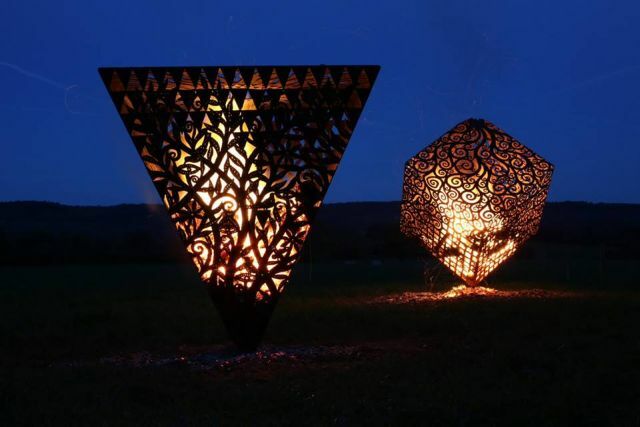 A few pictures of last nights fire sculpture burn at Moorwood Arts. A very successful culmination to my trip with lots of good response to the fire sculpture from the 200+ people attending, which was exciting . The Fire cube worked well and I was very happy to see it ablaze after such an intense cutting session.The Sun-Moon fire ball and a copper wall sculpture (pictures to come soon) have sold which covers a few costs and makes the mission worth while and satisfying.